As South Carolina lawmakers take action to remove the Confederate flag from government grounds — Gov. Nikki Haley will sign a bill to this effect on Thursday afternoon — another set of Southern lawmakers are doing the exact opposite. The Ocala Star-Banner reported that a unanimous vote by commission members in Marion County, Florida will restore the Confederate flag in front of its government complex. The county commissioner had removed the flag from the grounds just two weeks prior, citing concerns over its negative connotations. Following the June 17 killing of nine African-American churchgoers in Charleston, South Carolina, debate over the Confederate flag heated up as photos of accused gunman Dylann Roof posing with the flag and other racist symbols took over the Internet. For the first time, both Democrats and Republican politicians called for the flag's removal from statehouse grounds across the South, despite outcry from supporters over its ties to "Southern heritage" and history. That was when Bill Kaufman, commissioner of Marion County, took action to remove the flag from the government building. A spokesperson for the county told the Ocala Star-Banner that the decision was made without a vote from the other county board members and without hearing any calls for the flag's removal from local residents. It turns out, Marion County residents had a strong opinion about whether the Confederate flag — which many have argued is a symbol of treason and hatred — should fly in front of their public complex. In an interview with the Star-Banner, resident John Horrighs, a member of the Sons of Union Veterans of the Civil War, said he thought officials were simply "bowing to political correctness." He added, "They are jumping on the bandwagon of the national dislike of the flag." 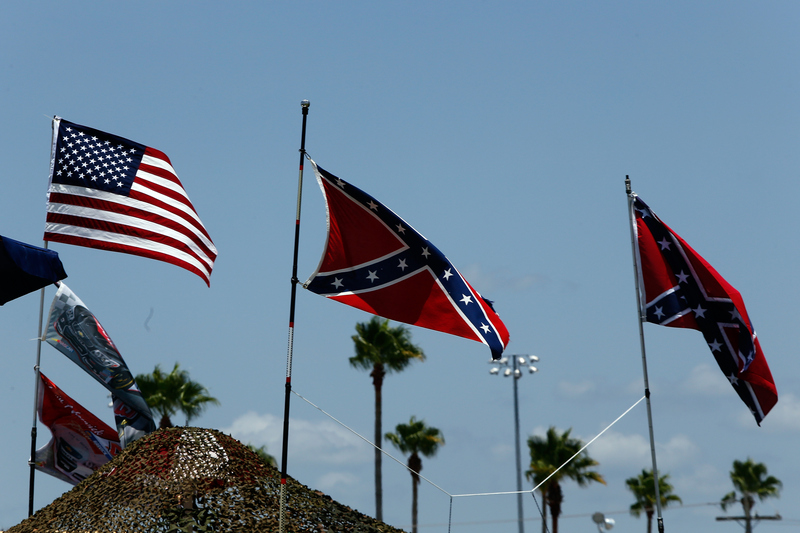 At the same time, the number of pro-Confederate rallies in Florida skyrocketed, as residents staged protests and demonstrations in support of "Southern pride." At a demonstration in Tampa, Florida — just 80 miles east of Marion County — hundreds gathered to express concerns that backlash against the symbol was overblown, misplaced, or simply misinformed. I don't think it's disrespectful. I think we're trying to be very respectful of all our citizens. [...] Most folks have said it's reasonable to have something like this in a museum somewhere so that people can learn from history and those kinds of things. The problem — you know, one of our challenges is that we don't have a museum. According to the Tampa Bay Times, the Marion County Commission has tapped the local historical society to put together an outdoor museum explaining the historical significance of all five flags displayed on the county grounds: American, British, French, Spanish, and Confederate.